Indian Motorcycle India has launched the new Indian Scout Sixty in India at Rs 11.99 lakh (ex-Delhi). The motorcycle will be available in showrooms from July 2016. Positioned below the Indian Scout, the Scout Sixty is the most affordable Indian in the country. However, the bike is a CBU and could have been priced lower if Indian Motorcycle India would've chosen the CKD route. We spoke to the company and it has confirmed that there are no plans, as of now, to introduce CKD bikes in the country. Since it is based on the Scout, the Scout Sixty shares the same chassis, brakes and suspension with its elder sibling. The engine is based on the Scout's V-Twin engine but displaces 999cc in the Scout Sixty. It produces 78PS and 88.8Nm at 5,800rpm. The motorcycle features similar styling like the Scout. The sweeping, broad fenders, long fuel tank and the single seat bestows the Scout Sixty with a loads of appeal. The big V-twin motor with the long exhaust pipes is attention grabbing, and overall the bike looks pretty neat. The instrumentation includes a digital tachometer, speedometer, trip meter, engine temperature and low fuel light. Speaking about the launch of the new Indian Scout Sixty, Pankaj Dubey, managing director, Polaris India Private Limited, said, "The legendary heritage of the Indian Scout is carried forward in the all-new 2016 Indian Scout Sixty. Expertly balanced and lightweight, the bike has won the hearts of bike enthusiasts around the globe. 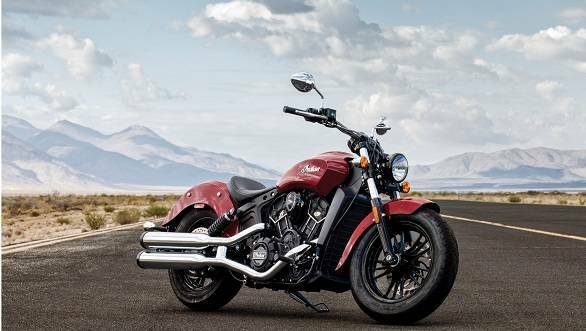 I am quite sure that the introduction of the 2016 Indian Scout Sixty in the Indian market will help us grow in terms of volumes in the fast-growing luxury commuter category." Customers can choose from over 200 accessories and personalise their Indian Scout Sixty. The list of accessories includes the seat, handlebar and foot peg relocators that allow the rider to tailor the riding position. In addition, there are saddlebags, wire-spoke wheels and a quick release windscreen to choose from. We've tested the Indian Scout before and expect the Scout Sixty to feature similar levels of fit and finish. The Indian Scout is priced in India at Rs 12.87 lakh (ex-Delhi) and for that extra cash (Rs 88,000) you get a bigger engine (1,131cc) that develops 100PS and 97.7Nm at 5,900rpm. Watch this space for a detailed road test of the Indian Scout Sixty.